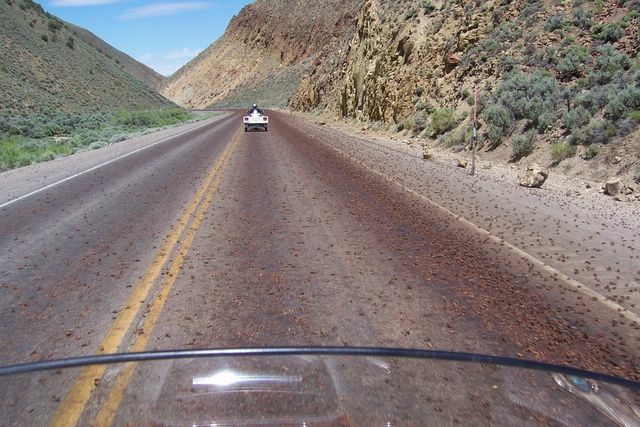 The road is covered with "Morman Crickets". They were all over the town of Austin, and were so bad on the road that they had snow plows out scraping them off the Highway. We had about a 10 mile stretch that was very slick and smelly. I didn't take any pictures where they were very deep, needed both hands and eyes just to keep upright. I tried to talk Skid and Sandy into getting off and standing in them for a picture, but they weren't buying it!